holly bechiri | Apple pie, anyone? I give you all permission to make the changes to your homes that you dreamed about on Thursday. Send me pictures, ok? I love April because I’m not behind on anything yet. According to this schedule, I’m completely fine! But in another month, I’ll still be looking for plants… putting up garden fence… hauling compost. Late to the party. I need more kids to help out around here. Make a note: have more children. Now, your kitchen scraps, plant leaves, paper, and other organic trash has a better home than the landfill: in the compost. You may think composting is something only manageable in the boonies, but YOU’RE WRONG. And, I mean that in the nicest way possible. Saturday, The Franklin Farm was host to its 2nd annual “Till -n- Turd.” Smack-dab in the center of G-Rap! Basically, Holly convinces a bunch of people that they should come over and spread cow poop all over their yard. It’s awesome. From Holly: My husband and I have a “cow share” so that we can have raw milk. Basically, we own a portion of a cow and therefore have legal rights to its “by-products” of raw milk and… manure. Our farmer composts the manure until it’s just about the best organic fertilizer ever, and we get to pick up a truckload of it for our use. We drive back from the countryside, through the center of the city to our little homestead with a truckload of poop. It gets spread by the bucketful throughout our yard, then tilled into the garden beds. Recycle: The (free) city recycling program. That is, by far, the largest bin. 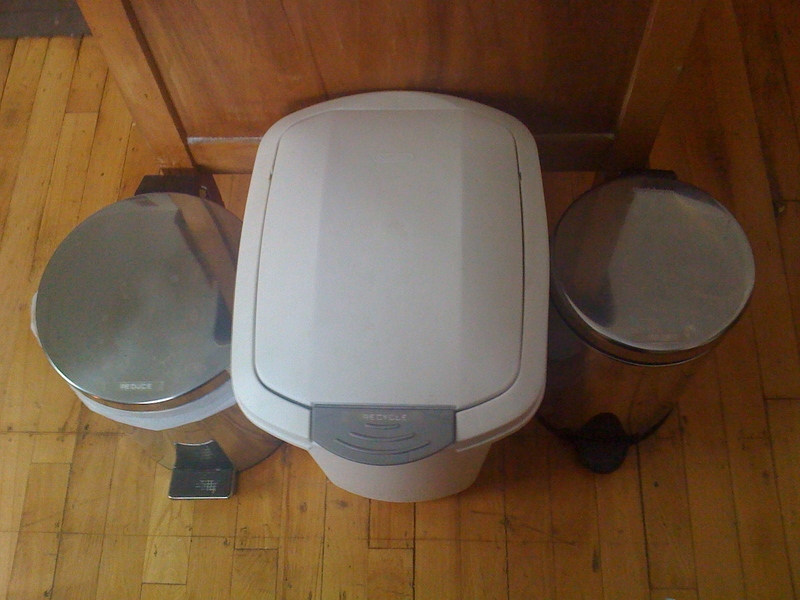 Reduce: The regular trash goes into the smallest of the three bins, thanks to the other two. Because of our recycling and composting and intentional shopping, it takes 2 or 3 weeks to fill a city garbage bag, even with a newborn in disposable diapers. I’d like to say it’s because we care so much about the earth, but honestly what kept us doing the separating in the beginning was the saved money and the bragging rights that our garbage had been cut down to 1/4 of what it was before was started composting and recycling. Now it’s just so normal we don’t even need motivation: it’s just the way life is. The garden, meanwhile, is still smelling like …ahem… the country today. 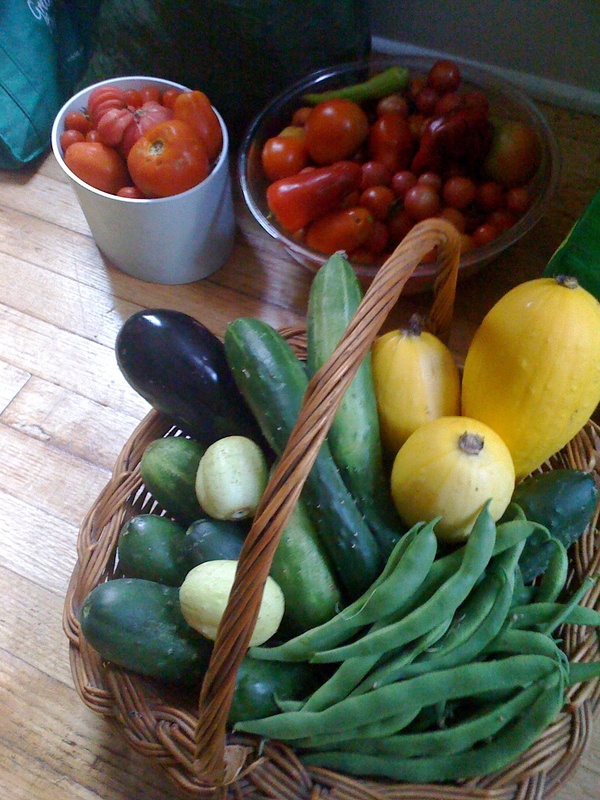 I know it will pay off this summer when our produce just seems to produce much more than other friends in the city with gardens. Thanks to a day of spreading composted manure around our yard, and a few days of noticing that smell, our tomatoes will be weighed down with fruit, our watermelon will produce well over a dozen fruits per plant, and the whole yard in general will be “going to town,” as they say. Do you have a recycling and/or compost system? At TexasNorth, we have LOTS of animal by-product. Awesome. You are welcome to it ANY TIME. I’m not kidding. I very much want a compost tumbler (like this one) that will sit neatly off the back porch and make beautiful potting dirt, but another person I live with thinks I’m crazy with a k. That’s fine. That’s just FINE. Right now, the table scraps that don’t go to the barn cats or chickens go in a horribly un-cute 5-gallon bucket on the back porch. Eventually, this bucket makes it out to the big bi-product piles and mixes in. The unsightly bucket sits next to some very chic 30-gallon metal trash cans. One holds aluminum and plastic soda pop cans and the other holds metal and plastic I take to the Rockford transfer station once a month. The black signs are just scrap wood painted with chalkboard paint. The bins are large enough that I’m not changing bags every week and can handle a party or two before overflowing. Gardening daunting to me. I’m terrible at it. But, help abounds. The web is full of fun people and places that can help you grow one or 40 plants in an apartment, a 40-acre farm, or anywhere in-between. My favorite gardening supplier is HERE. I want one of everything in their catalog. They makes me feel like I can grow broccoli, which is not true and has been proven many times… but they make me feel that way and I like them. This is a great website to help you in your garden. Triscuit has a super fun new website that will help you plant your own garden and talk to other folks… plus the design is cute cute cute. Here’s a great site to find out more about heirloom seeds. Local Harvest will help you find the closest garden to you that sells shares of their product… all you have to do is pay once a season and pick up the goods! They also have a seed section. So, dig in. 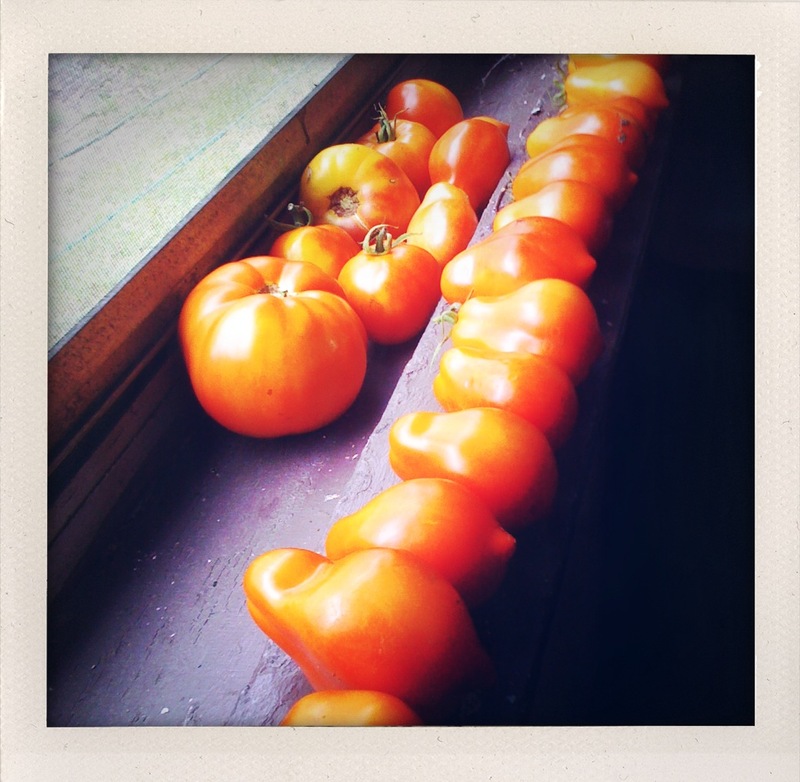 Get your hands dirty, plant some tomatoes on your porch if nothing else, and reap the harvest of the season. It feels amazing, and tastes even better. Holly and her husband, Masi (tall, dark, handsome, and European) own The Franklin Farm here in Grand Rapids. They’re also passionate about intentional living- community, conversation, co-creating. Gardening is making a huge comeback in popularity- especially in the cities- as people realize they both want and need more personal control over their food. But, gardening within city concrete can be hard. I asked Holly a few questions about the community garden at The Franklin Farm, and she obliged. Here’s part 2 of Urban Gardening (part 1 can be read HERE). Front yard: in the front yard, we get a little more decorative (though still edible) with our plants. 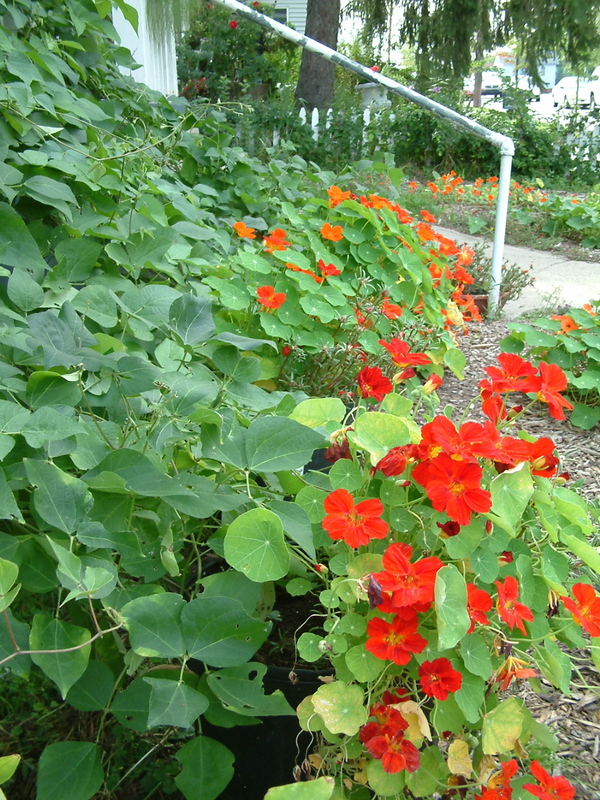 We trail scarlet runner beans up the front of the porches, and plant yellow orange and red nasturtiums all over. Hiding within that are winter squash..with their giant yellow blooms. By mid-july it’s the most lush cacophony of colors on the block. Best thing about growing produce in the city? The best thing about growing produce Anywhere is being able to walk out your kitchen door and get still-warm tomatoes, fresh herbs, and some greens and have an instant gorgeous dinner. The great thing about doing it so completely in the city is that you challenge your neighbors and friends to rethink how they utilize the land they have around them. We’ve noticed several neighbors planting flowers since we started, in yards that were previously neglected completely. Because of our shared interest in growing things, we can also have conversations with our neighbors-about things other than the weather! Hardest thing about gardening in the city? I know for some people it can be finding good soil and enough sun. Thankfully, we have a cow share for raw milk …and any other animal by-products are thus part of our ownership as well. That takes care of the poor soil problem! I distinctly remember while house shopping making sure that the back yard, at least, would not be shady. That was on our list of needs for our home. Do you fertilize or plant and pray? 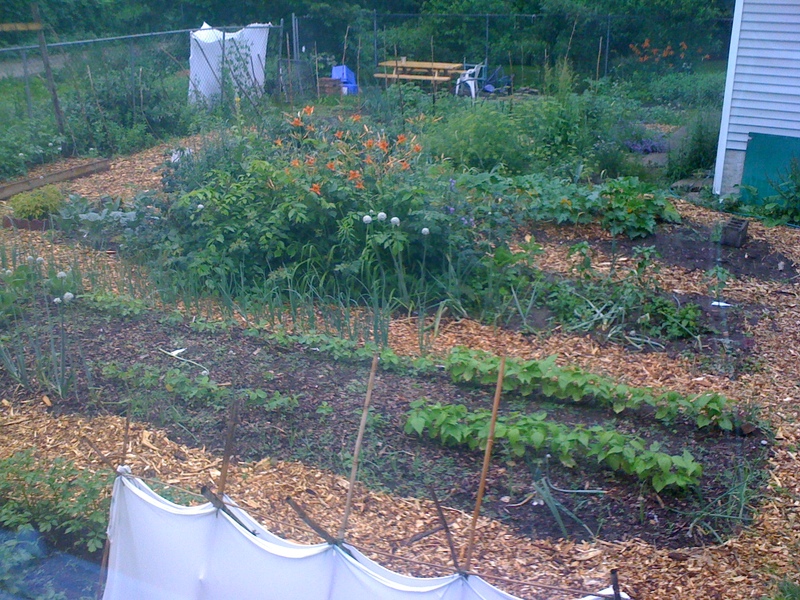 I love the idea of a communuty garden and shared-work. How do you divy up the communal bounty between share-holders of the garden? We have four households in our community, and everyone wants to be a part of the garden! But those households have different limitations of time, so we have a system to make sure everyone kind of gets what they give. We just keep a rough estimate going (so rough: like “a lot, somewhat, not much at all” kinds of estimates), and the more you put in to the garden, the more you get back. So if one household doesn’t end up doing much in the garden, they don’t get much of the “haul.” Basically, everyone can step out back to get things for dinner as needed/wanted and then the excess gets divided up according to those estimates. 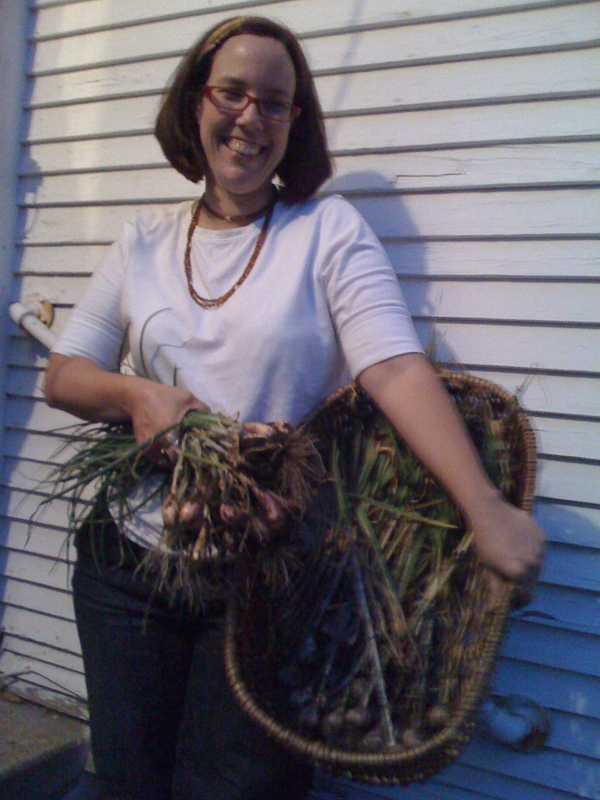 So our onion crop last year, for example, produced about 350 onions. Some of us got a bucketful, some of us got a small bag. And everyone felt like they were getting more than they had put in the work to deserve. Best books for learning about gardening? I’ve really enjoyed the books Food not Lawns and Grow Great Grub. Those are specifically for the city environment, and have some basics and some fun projects. Are you and Masi equally yoked in the garden or does one person handle most of the dirty work? Massi loves nurturing, so he’s the one who is constantly out there checking on everything, making sure everything is watered. He’s the constant caretaker. I, on the other hand, go gangbusters in the spring, setting everything up and organizing, then I slow down for a few months, then I go gangbusters again, harvesting and cooking and preserving and putting up for the winter. So over the year, we’re pretty equal. And we both get to focus on the part that we enjoy! The dirty work, for us, is the weeding. It’s very satisfying once you get started, but it’s too easy to put off. From Holly: We will, in fact, be letting people know about events and things happening at The Franklin Farm (in the garden or otherwise) on our facebook page. Also, I’m not opposed at all to having people come and visit, maybe get some practice in if they’d like to get some “project based learning.” But seriously: they can come try it out, see how it’s done, get a feel for what it’s like for your backyard to become a farm. As it turns out, it’s not all that odd and pretty gorgeous. It’s a great way to get “out of the city” without leaving the city. From KatieKate: I’ve got one more post up my sleeve involving compost & manure in the city, buying plants, building raised beds, and all that jazz next Monday. Until then, you can find Holly HERE, HERE, and HERE. 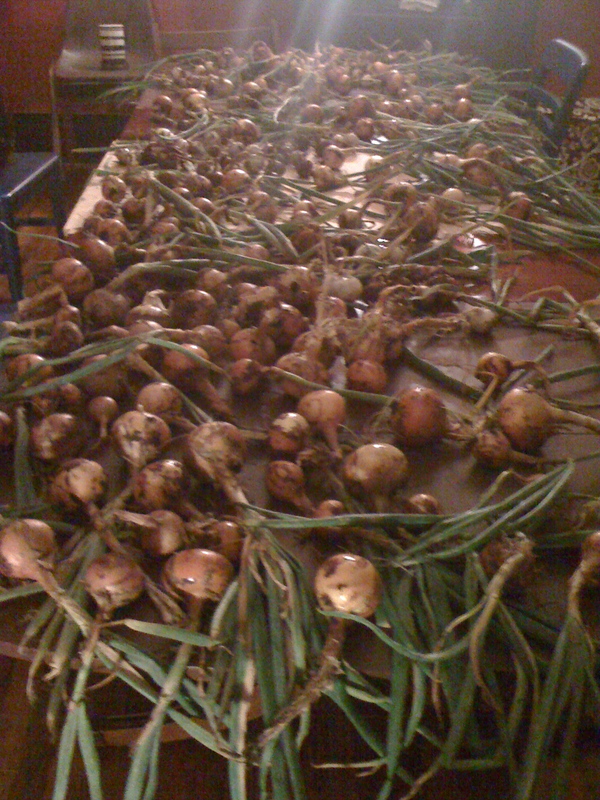 Onions curing: this is our dining table, full of about 400 onions-they had to be harvested, but it was forecasted to be a rainy week. so instead of curing them outside, our home smelled like onions and dirt for a week straight. I’m not gonna lie, I loved it. Folks, Pat’s family will be walking in the Ft. Worth Susan G. Komen Race for the Cure. If you’d like to support them, tax-deductible donations can be sent online HERE. An update from our Mrs. Pat can be read HERE. I’d like to introduce you to a dear friend of mine… though, we’ve never sat down for hot chocolate together… Holly. Holly and her husband, Masi (tall, dark, handsome, and European) own The Franklin Farm here in Grand Rapids. They’re also passionate about intentional living- community, conversation, co-creating. It’s a beautiful thing. Gardening is making a huge comeback in popularity- especially in the cities- as people realize they both want and need more personal control over their food. But, gardening within city concrete can be hard. I asked if Holly would answer a few questions about the community garden at The Franklin Farm, and she obliged. Here’s part 1 of Urban Gardening. What is your whole name and the story behind it? I remember my mom having a vegetable garden in a part of our yard, rhubarb in a patch along the street, and strawberries in a patch out our back door. I distinctly remember running through and picking food from each of those places to munch on while i was running around outside playing. My mother, however, remembers my unwillingness to Work in the garden-so she’s quite surprised at us turning our yard into garden space now. How many years have you been gardening at the Franklin Farm? This will be our 3rd year gardening. The first season we owned the houses, we just kind of watched where and how things grew, the amount of sunlight that surrounding trees blocked, and so on. Well, that and we were fixing up old, neglected houses pretty much full time. What are your go-to crops? The no-fails? I used to think lettuce was a go-to first crop. Then last year, we planted seeds 4 times before we got germination for some of them. (from Katie: Um, agreed. I cannot grow lettuce. Walter Tango.) I have no idea what was going on there, but it did seem to be a strange year weather-wise for a lot of crops. I honestly think most things aren’t as hard as newcomers assume, but tomatoes are great because they’re pretty hardy and let’s face it, So Rewarding. herbs are wonderful and really add a lot to your meals (and are so expensive to buy at the store!). I’d say whatever you really just love finding at the farmer’s market, that’s what you should grow. Go for the most pleasure-giving plants you can think of. Let’s face it, starting a garden is not also the time we should be bound and determined to start eating those weird vegetables we hate the smell of when we’re eating them. If you don’t want to eat them, why would you have any desire to spend the time to grow them? Stick with what you know you’ll love eating. Then grow from there. The other thing I tell first-timers is that you don’t have to mess with seeds. You can start with little plants, and honestly in this part of the country, that can increase your crop yield significantly before the snow starts flying again. Some things are easy from seed though, and I wouldn’t bother buying the plants of the following: greens/lettuces, peas, and beans. I also will often plant basil plants and also basil seeds… but I may be a little obsessed with basil. Tomatoes, I recommend getting small plants, a couple medium plants, and then treat yourself to one already-large plant. Who wants to wait til August for a tomato! That one big one will keep you working and taking care of the smaller ones, knowing that you’ll be rewarded so much sooner. Holly will be back with Part II next Monday. Until then, you can find Holly HERE, HERE, and HERE. Y’all garden. Speak up! What always works in your garden? What’s fun for kiddos? Any hidden tricks up your sleeve?